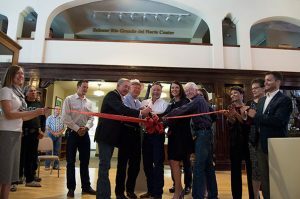 A quarter-million-dollar donation has made possible the establishment of the Salazar Rio Grande del Norte Center housed in the Adams State University Luther Bean Museum, as well as a scholarship fund. The Salazar Rio Grande del Norte Center, was a generous donation from the Salazar Family, in memory of their parents, Emma and Henry Salazar. Salazar children include former U.S. Secretary of the Interior, Ken Salazar. He also served as Colorado’s Attorney General and then as a U.S. Senator for Colorado. Their son John Salazar, former Commissioner of the Colorado Department of Agriculture and former U.S. representative from Colorado, is a 1982 graduate of Adams State. Their son LeRoy is an Adams State Board of Trustee member. Other surviving children include Adams State alumna Margaret ‘88, Elaine, Elliott and June. The Salazar Center is dedicated to preservation of the natural and cultural resources of the upper Rio Grande region. The collection reflects the rich history and archaeology of the Rio Grande in Colorado. This ranges from the ancient history of Native Americans in the Rio Grande gorge to exploration from Santa Fe into the San Luis Valley that began in the 1700s, and the first settlements in Colorado, begun immediately after the Mexican-American War in 1848. The Salazar Rio Grande del Norte Center includes a paid internship for students in a range of disciplines. This web site and virtual gallery will promote opportunities for study and research by faculty, researchers, students, and the public, not only locally, but also nationally and internationally. The Salazars continue to farm and ranch in the San Luis Valley, where their ancestors were among the first settlers. The $250,000 donation includes a $100,000 contribution to the Emma & Henry Salazar Memorial Scholarship Fund for first generation Adams State students, which was recently established by the family. An additional $100,000 funded the development of the Salazar Center. Center start-up, internships, and museum operations will be supported by the remaining $50,000. Plans also call for partnering with area groups that promote the center’s ideals, such as the Sangre de Cristo National Heritage Area, Hilos Culturales, Regional BOCES, and the ASU Archeology Field School. Established in 1976, the Luther Bean Museum houses collections that represent the history of the San Luis Valley and its Native American, Hispaño, and Anglo cultures.